Leo Vegas is truly a generous online casino. You can always look forward to special promotions and campaigns and this time of the year is no exception. Because it’s beginning to look a lot like Christmas at Leo Vegas. Make sure you visit Leo Vegas today! None the less but four leaderboards will take place this month at Leo Vegas – the first one is ending tomorrow, the 7th of December. The second one will start on the 8th and continue until the 14th. After that there are two more leaderboards with more chances to win. There will be 50 winners each week and the first prize called “the star prize” is none the less but £5000. To collect points you will have to play casino games at Leo Vegas. For every £10 you deposit and wager on any of the casino games you will receive 1 point. And if you do this on any of the selected Christmas games on desktop you will get 2 points. But we recommend you to play the chosen games on Leo Vegas mobile casino in order to receive 3 points. Santa’s Christmas Selection consists of Flowers Christmas Edition, Fruit Shop Christmas Edition, Secrets of Christmas, Merry Xmas, Taco Brothers Saving Christmas, Happy Holidays, Xmas Joker and Winterberries. The leaderboards aren’t the only thing worth visiting Leo Vegas this month. There is a NetEnt Live Roulette Giveaway as well and you can join the raffle and hopefully grab some cash prizes on the way. Just log in at Leo Vegas and play the NetEnt Live Roulette – for every 10 spins you make you will earn one ticket to the weekly draw. The special Christmas Roulette will be available every day between 14:00 and 02:00 until the 18th of December.Last but not least you have the chance to claim Secret Santa Spins at Leo Vegas during the great Christmas promo 2016. The fun part is that the amount of free spins on which videoslot will be a surprise! 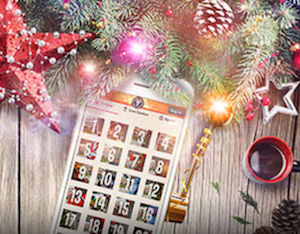 Just open the calendar and check out which game is chosen and how many bonus spins you will get. To qualify to this offer you will have to deposit £20 and wager the money on your favorite casino game at Leo Vegas.